The other day, Leonidas invited me along to the opening of a Greek art exhibit in downtown Beijing. He in turn had been welcomed to the event by his old Greek teacher at Beida, and I finally heard Leonidas live up to his name and speak Greek – albeit modern, not ancient. I couldn’t understand a word of course (it was all Chinese to me), but Leonidas enthusiastically rolled his ‘r’s and clearly is not as rusty as he claims to be. Imagine a container in which everything which exists is contained. Is the container itself inside? His English is one of the best of the Chinese I follow on this blog, together with Tony’s. This means that he often falls into the trap laid for those proficient at another language: over-using big and impressive words where little ones would do. The canapes aren’t tasty, they’re “succulent”. The event isn’t interesting, it’s “most stimulating”. That kind of thing. Each word pronounced carefully and with slow relish, not out of pretention (or only a little bit), but more – my guess – out of a kind of thinking which runs “I’ve just studied about 10,000 infrequently used English words for my GRE, here is a situation where one of them seems vaguely appropriate … so I’m damn well going to say it”. On which note, Leonidas has just got the results back from the GRE exam he took a month or two back. I won’t publish them, obviously, but I’m sure he won’t mind me mentioning that he got 800 out of 800 in the ‘quantative section’ (i.e. maths). In the writing section, where his English was put to the test, he was disappointed by his score (though it didn’t strike me as too bad) and is uncertain if it will be good enough for his coming application to study in America. But – typical Leonidas thoughtfulness – he took this GRE a year earlier than he needed to, giving the option of another crack next year. There is more to come on his plans, and probably more hidden skills of his I am yet to discover. For the moment, you may be wondering what relevance the title of this post has to all this. Well, it seems to be what the artist whose works were on exhibit had in mind: that is, a visual exploration of the shared whatever between ancient China and ancient Greece. In my eyes, and I’m no expert, this is a pretty lame, cigarette-paper thin concept – and the art struck me as something a kid did hastily on KidPix for his art homework. That’s why I wrote about Leonidas instead of it. But, if your curiosity is still thirsty, here are some pics I took on my mobile. Galinihta! 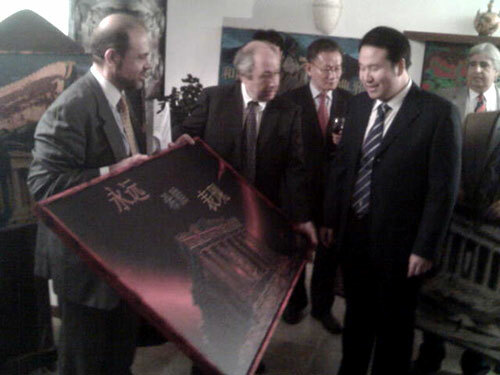 The Greek ambassador to China (middle) leapt on this exhibit as an opportunity to fawn over useful connections in Beijing. Here he presents a painting from the exhibit to the head of the Ministry of Something-to-do-with-The-Arts-which-I-didn’t-quite-catch. A typical example of the paintings on display. Maybe I’m a pretentious git, but I find this atrocious. 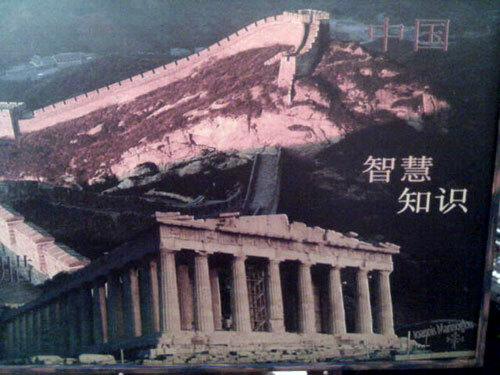 The Chinese characters read “Greece” … “China” … “wisdom” … “knowledge”. The symbol next to the artists’ name bottom right is of his star sign, Uranus. 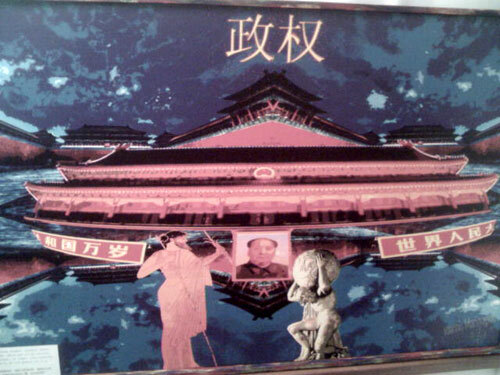 Zheng quan: “political power”. But what really, I mean, really, do Mao, Zeus (is that Zeus on the left?) and Atlas have in common? 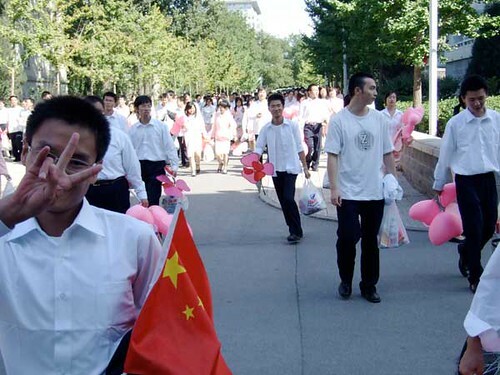 Outside of Mao’s imagination, and the concept of ‘pandering’, that is. 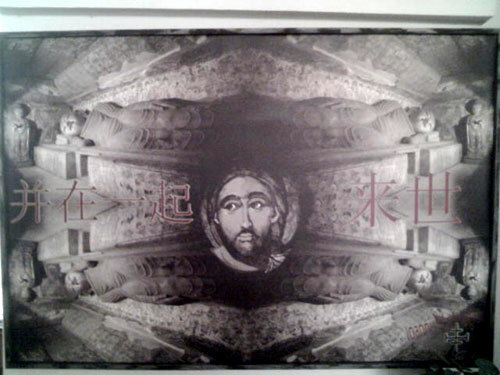 My personal favourite: Jesus’ disembodied head floating in the middle of four trippy-mirror-effect sleeping Buddhas*. The text on the left: “merge(d) together”; and on the right: “the afterlife”. Deep. Will China be drained of Leonidas’ brain? 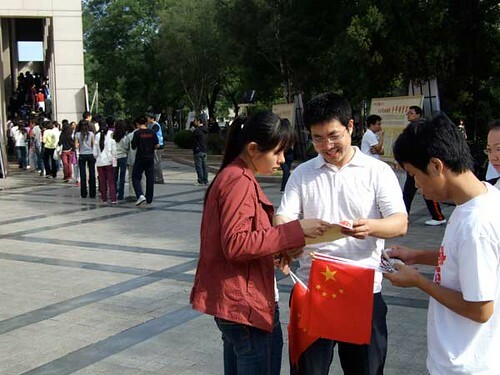 The brain drain (China’s best and brightest being lured by life overseas) is still one of China’s biggest problems – that Guardian piece by Jonathan Watts cites a study saying 7 out of 10 Chinese studying overseas don’t come back. So I’ll choose to politely ignore the Folex-hawking China Daily which declared the drain “reversed” back in 2003. Well, Leonidas is one of the brightest Beida students I know, and he hopes to take a PhD in America, possibly 5 years in Linguistics or a related field. So I asked him – though not in such alarmingly medical phrasing – if he thinks his brain will be drained. For one, his reasons for wanting to study in the US are different to those of a parallel Leonidas twenty years ago might have been. He simply wants to open his eyes and see what America is like. 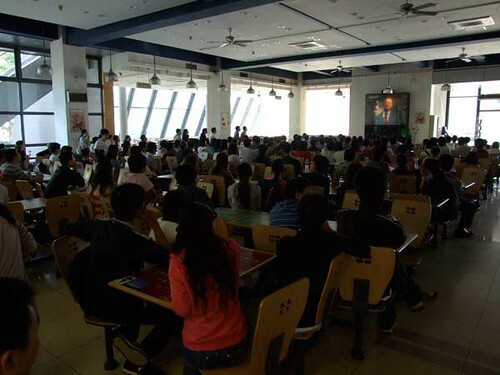 Just why I came to China. And, like me too (though the jury’s still out…), he wants to “seek a foreign experience but not a different lifestyle forever”. Those who go to live in America give up much: fathers, mothers, friends, memories. To go to America is to restart everything. The cost is very high. I can’t give up what I have in China. I can’t imagine beginning a new life in the USA. 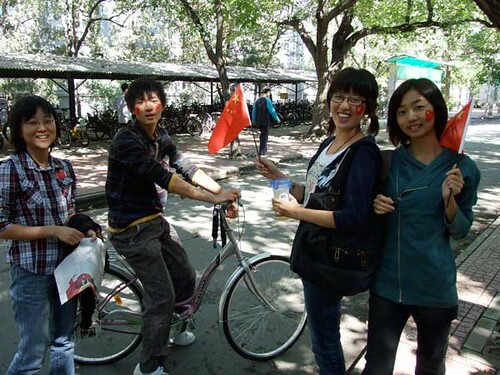 If I begin a new life, I don’t know if I can be accustomed to it … After all, I have spent almost 20 years education in a Chinese culture and atmosphere. So I think I have a different cultural system with America. This is too big a problem if I live there forever.